The San Diego Repertory Theater’s run of Maestro ends July 17. 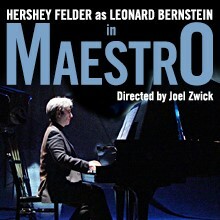 Written by Felder, his tour-de-force as Bernstein presents him as a complex, narcissistic musical genius. There are interesting insights into his sexuality and a new slant (to me) on Bernstein/Felder’s view of the Black Panther issue. I particularly enjoyed his early family stories growing up Jewish in Lawrence, Massachusetts. Musically, there’s everything from Bernstein’s show tunes to his symphonies, as well as paying homage to Beethoven and early composers. Felder’s piano prowess is on display throughout the play. For a full calendar of their 2016/2017 season, logon to www.sdrep.org. Special Note: Horton Plaza’s revised policy regarding validated parking now allows one hour free. After that, it is $2 per 15 minute intervals. This entry was posted in Around Town - San Diego and tagged bernstein, felder, music, theater. Bookmark the permalink.